The University of National and World Economy (UNWE) is the eldest, the most prestigious and the largest economic university in Southeastern Europe.  The academic Managing body makes efforts to implement the major objectives of university - to prepare the Bulgarian elite as it has always done since its establishment, to be a leader in the Bulgarian higher education, an integral part of the European educational and research area, to provide competitive educational services as well as to be a preferred place for the young people who want to acquire modern education. In 2012 for the second time (after 2006) the National Accreditation and Assessment Agency has given to the UNWE the highest assessment among all Bulgarian universities for the following six years. The UNWE has 8 Faculties: General Economics Faculty, Finance and Accountancy Faculty, Business Faculty, Economics of Infrastructure Faculty, International Economics and Politics Faculty, Management and Administration Faculty, Applied Informatics and Statistics Faculty and Law Faculty. It has 33 Departments, Institute of Post-Graduate Studies Division (including a Center for Facultative Education and Foreign Languages School), Institute of Economics and Politics, Institute of Creative Industries and Business, Institute of Entrepreneurship, Center for Distance Learning (including Regional Centers in Haskovo and Plovdiv), University Center for Intellectual Property, Inter-University Center for Career Development, etc. About 500 lecturers work at the UNWE and 300 of them are Professors and Associate Professors. In 2016 the UNWE has participated in 110 scientific research projects including 103 university ones, 4 national projects financed by the Scientific Research Fund of the Ministry of Education and Science and 3 international projects financed by the EU. 25 university scientific events have been held and 14 of them have been international. The University has an Educational Quality Management System certified by Intertek in compliance with the International Standard ISO 9001:2008. The UNWE occupies highly competitive positions. It has traditionally the largest number of prospective students and the record number of excellent students in comparison with the other universities in the country. The UNWE is the largest Bulgarian university having 21 534 students in full-time and distance form of education studying in 43 Bachelor`s degree specialities and 108 Master`s degree specialities as well as about 500 Bulgarian and foreign Doctoral students studying in 38 Doctoral degree programmes. UNWE is the coordinating university for Bulgaria in the Central European Initiative for relations between universities. It collaborates with more than 100 universities from all over the world and works with them on joint Master`s degree programmes, scientific research projects, distance learning, students and lecturers exchange. The UNWE has incorporates a credit system providing an opportunity for student mobility between the specialities as well as at other universities in the country and abroad. The University publishes Almanac, Yearbook and Scientific Works as well as the scientific magazine Economic and Social Alternatives (in Bulgarian and English language) and UNWE Newspaper (prepared by the students of Journalism). Since its establishment 98 years ago the university`s faculty members and graduates of UNWE are eminent scientists, government figures, ministers, deputies, politicians, the first Bulgarian European Commissioner after the Lisbon Treaty entered into force, ambassadors, representatives of the country in authoritative international organizations, mayors, public figures, businessmen, bankers, etc. Over the last years six of the Prime Ministers of Bulgaria are graduates of UNWE including the first woman Prime Minister. Holders of the honorary title of Doctor Honoris Causa of UNWE are authoritative persons from Europe and USA and among them are Prof. Joseph Stiglitz and Prof. Paul Krugman, holders of the Nobel Prize in Economics, Franz Fischler, European Commissioner for Agriculture, Prof. Václav Klaus, President of the Czech Republic, Prof. Danuta Hübner, European Commissioner, Prof. Francis Gurry, Director-General of the World Intellectual Property Organization (WIPO), Jean Claude Trichet, President of the European Central Bank, Prof. Taleb Rifai, Secretary-General of the UN World Tourism Organization )UNWTO, Irina Bokova, Director-General of UNESCO, etc.